exclusive west end neighbourhood overlooks the Humber River and is surrounded by a picturesque ravine and parklands. as per it’s French pronunciation offers the unique fall experience of salmon fishing in the Humber River. Whether you are a fishing enthusiast or not it remains a spectacle not to be missed. 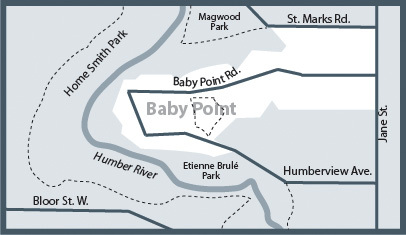 Baby Point is walking distance to local shops on Annette and Jane St. Here you will find an assortment of stores including European food stores, antique shops, grocery stores, variety stores and restaurants. Bloor West Village is a fifteen minute walk from Baby Point and offers a unique selection of specialty stores, bakeries, restaurants, book stores and various retail stores. Homes in this area were mostly built circa 1912 by Robert Home Smith a local developer at the time. 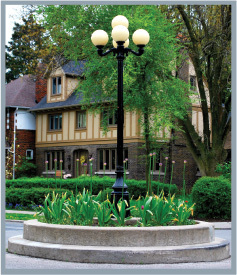 This area features quiet tree lined streets with large family sized homes and gardens.